Confidence, Accountability and Discipline. Those are the three values Chicago Bears GM Ryan Pace mentioned when asked about the immediate impact new head coach John Fox will have on the team. Values he says he will also use to judge the highest paid players on the team--Jay Cutler and Brandon Marshall. 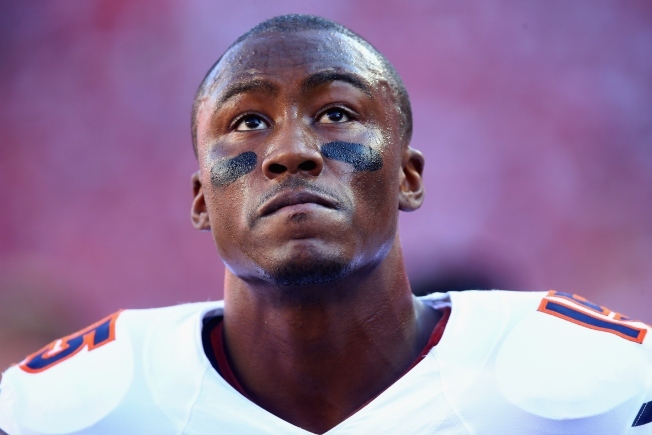 Brandon Marshall turns 31 years old in March, about the same time the Bears have to make a decision on whether or not they will keep the Pro Bowl receiver. Marshall suffered numerous injuries in 2014 from ankle injuries to broken ribs and collapsed lung. It showed on the stat sheet: 661 receptions for 721 yards was his 2nd lowest in eight years. Marshall signed a new four-year deal to stay in Chicago, but that was with former General Manager Phil Emery. "He's a guy that's a big target, helps you a lot in the red area and he's done it in the league" Bears head coach John Fox admitted Wednesday, "we're trying to evaluate where everybody fits and where to best use them." It's anything but a guarantee. Marshall made headlines throughout the season from a rambling press conference he called to defend himself from years old domestic abuse charges to a locker room rant after losing to the Dolphins to his strange behavior on social media challenging a Lions fan to a boxing match. New head coach John Fox and Ryan Pace met with Marshall but admit they did not address his in season network TV commitment. Wednesday in Indianapolis they sent a message of what they expect from their star wide receiver and any player in a Bears uniform. "I will say regardless of who it is, I think their focus and energy needs to remain on what's going to help us win a championship," Fox said. Pace and Fox say sometimes outside perceptions of players aren't the same inside Halas Hall. That statement also appears to relate to the Bears starting quarterback Jay Cutler. "There's a lot we see on tape obviously," Pace said, "but there's more you want to see in person and that goes for all our players." Pace wouldn't commit to Cutler as the Bears starter, saying they were still evaluating him. Fox said they are only one-fourth of the way through the interview process. "Cutler has outstanding physical talent there's no denying that," Pace said. "It's just getting to know the individual and all the other intangibles that come with the position that make a great QB. And that's where we are now. And that really takes getting to know the person and that's the process we're going through. Me & John have been through a lot of different QBs, so its just figuring out him as a person." The Bears have plenty of tape to watch on Cutler after a record setting 2013 season under Marc Trestman where he gained a franchise best 6,109 yards and 445 points, 2nd in the NFL. Cutler regressed in 2014 and was benched five days. The Bears failed to score 30 points in a game while Cutler led the league with 24 turnovers. The Bears admit they don't have to make a decision until March 12, the third day of the 2015 league year.